Today in the board room of the Institut National de Santé et de Recherche Médicale (INSERM) there are portraits of the past and present directors of this, the most important public institution in France charged with conducting research in medicine and public health. The first portrait is of Louis Bugnard who in 1946 was named director of the Institut National d'Hygiène (INH), the name under which INSERM was originally created. Noticeably absent, however, is the portrait of Bugnard's predecessor, André Chevallier, the creator of the INH in 1941. This omission is a reminder of the circumstances in which the organization began, not to mention the difficulties historians still face in dealing equitably with the Vichy regime. For example, this government which carries the burden of the most humiliating defeat in French history, rarely receives credit for some of its achievements, such as its social policy which historian Pierre Guillaume (Le rôle du médecin depuis deux siècles (1800-1945), Paris, Association pour l'étude de l'histoire de la Sécurité sociale, 1996) notes is hardly mentionedby his colleague Robert Paxton (Vichy France : Old Guard and New Order, New York A A Knopf, 1972) . It is revealing to ask why it was under the Vichy government -- a regime unquestionably founded on anti-democratic principles -- that the first ongoing government organization was created for research in medicine and public health in France. One hypothesis suggested by some Anglo-Saxon authors - i.e.WH Schneider concerning eugenics in France (Quantity or Quality, the Quest for biological regeneration in Twentieth Century France, Cambridge U. Press, 1990) and R.N. Proctor about the campaign against cancer in Germany (The Nazi War on Cancer, Princeton U. Press, 1999) has some relevance. It presumes that an authoritarian regime - let alone totalitarian - is more capable of establishing a health policy than a parliamentary democracy which is more sensitive to the protection of the individual and minorities. Moreover, in the case of France, such an opportunity appeared to be favourable in reducing the former but traditional gap between social and liberal medicine (on this, see L. Murard & P. Zylbermann, 'L'hygiène dans la République. La santé en France ou l'utopie contrariée', Paris, Fayard, 1996). In other words, it may be necessary to give credit to those put in power by Marshal Pétain who succeeded in accomplishing in one year what the defunct Third Republic failed to do despite decades of parliamentary discussion about the health of the public. But it is also necessary to recognize the importance of American aid, and in particular that of the Rockefeller Foundation in the genesis of the INH, as well as in the curious fate of its director, André Chevallier, after the Second World War. 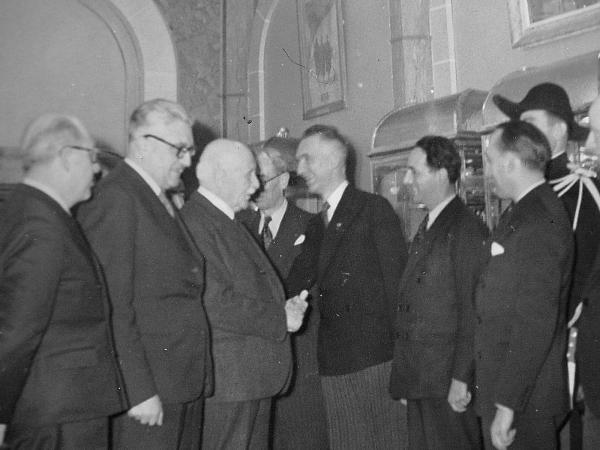 In 1940, with the help of the American philanthropy, the Vichy government gave public health a relatively low administrative profile - that of a general secretariat under the Ministry of the Family - but a strong impulsion. The General Secretary for Public Health was Dr. Serge Huard, an enterprising and well-respected surgeon (and intern of the Paris hospitals), even if not surprisingly, he was politically conservative. In August 1941, Huard was named head of a newly created Ministry of Health by the technocratically oriented government of Admiral Darlan. This gave him even more power to realize reforms which would increase government control over not only public health but also the organization of medicine, including hospitals. In fact, this had already begun with the Law of October 7, 1940 creating the Ordre National des Médecins which replaced the doctors' professional organization outlawed by Vichy in an effort to increase the state's control over medicine. The attempt to increase state control was strongly resisted by doctors and its identification with Huard was one of the reasons for his stepping down in April 1942. Other examples of these efforts were a pharmacy law of September 11, 1941 and the Hospital Law of December 21, 1941 which created a modern statute for hospitals, including access to all citizens and not just the indigent, the beginning of full-time hospital clinicians, and many other measures which anticipated the postwar reforms of Robert Debré. It was in this same spirit that the INH was created by the Law of November 30, 1941. 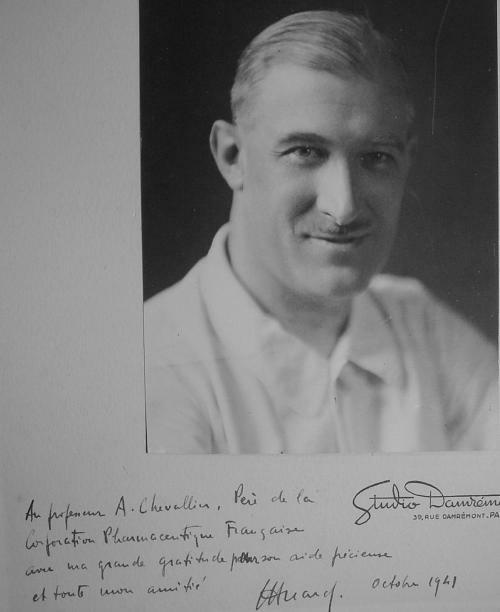 The first director of the INH was professor André Chevallier who had been a professor of physioloy at the Faculté de Médecine de Marseille since 1930. Chevallier was certainly choosen more as a scientific expert than for any political connections. Actually he was a physician interested in research that should be considered as a politically naive medical mandarin, what one knows was not the case for most of his colleagues. Before the Second World War, and thanks to his scientific training, Chevallier was able to design a special spectrophotometer to test the amount of vitamin A in humans. His research had been supported by the Rockefeller Foundation as well as the French CNRS, indicating he enjoyed an international reputation among physiologists specializing in nutrition. In this regard, it is worth noting the importance of what can be called a French school of nutrition physiology, among whom one of the key figures was André Mayer. In 1938 Mayer established under the CNRS a "Commission on Nutrition Problems," which included Emile Terroine, Lucie Randoin (of the Ecole Pratique des Hautes Etudes), Michel Macheboeuf (of the University of Bordeaux), and André Chevallier. In the summer of 1940 Chevallier was sounded out by his colleague Macheboeuf to sit on a 'College des experts de la défense nationale' (CEDN) created at Vichy with no less a goal than getting the country back on track after its overwhelming defeat. The head of this committee was General (and Polytechnician) Barrillon, and it included a number of men who worked in military medicine and public health, such as Eugène Aujaleu (who later became the first director of INSERM) . Evidently, the first problem tackled by the CEDN was the food supply for a population defeated in war and burdened by the heavy obligations agreed to in the armistice and German occupation. On August 12, 1940 André Chevallier presented a report to the CEDN on the avaliability and importance of vitamin A. He made three importan points: 1) humans can neither synthesize nor store vitamin A; 2) of all the vitamins, it is the least readily available; and 3) the consequences of vitamin A deficiency (hypovitaminosis A) are extremely serious and can lead to irreversible lesions in children and adolescents. To underscore the serious nature of the problem, Chevallier described the findings of a study in Denmark after the First World War where the excessive exportation of milk products brought a dramatic rise in infantile mortality, and the experience in Spain during the civil war where food shortages caused dwarfism in 500,000 children. Following his report, Chevallier was charged by the CEDN with creating a production system, utilizing the Atlantic ports and the expansion of the Byla factory in Gentilly. He and Macheboeuf were also given official responsibility to contact American relief organizations who might be willing to supply vitamin fortified cookies and candy for French children. After all, with the help of the Rockefeller Office in Paris (dr. George K. Strode, IHD) which could stay in occupied France up to the spring of 1941, Chevallier settled an hygiene institute in the faculty of Marseille whose main - and most usefull task - was to investigate the shortage of food supplies in the big overcrowded mediteranean city (dr. Youmans, dr. Kulhmann). In his role as government health expert Chevallier also had responsibility for assuring medical supplies. 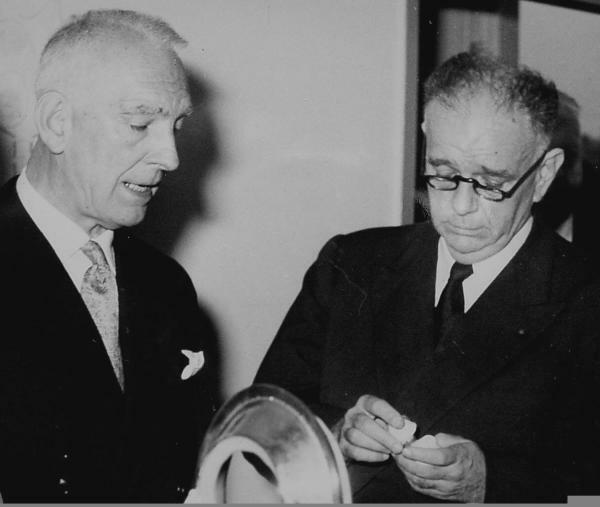 In September 1940 he prepared a pharmaceutical law for Huard whose purpose was to help supply the unoccuppied zone with insulin and outlaw the exportation of certain French pharmaceuticals. It was, thus, in the context of assuring sufficient vitamins and drugs that Huard and Chevallier arrived at the idea that France needed " an active health policy to be carried out by a strong Minister of Health"(letter from Chevallier to Huard, 20 sept 1940, Private papers of André Chevallier, hereafter cited as arch. AC). 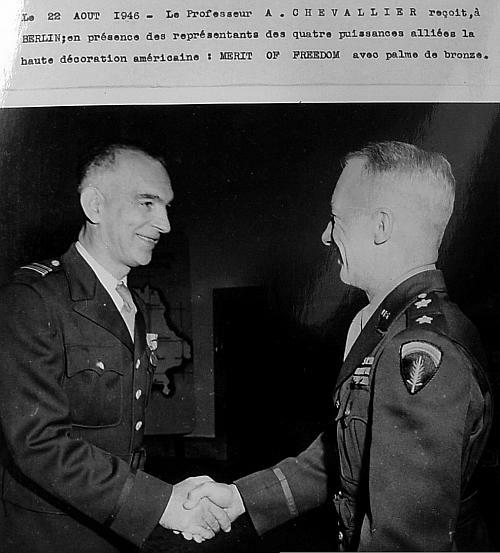 Both agreed that a strong French health administration was indispensible to resolve the problem of shortages and to take full advantage of American aid, such as the food and medical supplies furnished by the American Friends Service Committee (Quakers) or the American Red Cross which by the beginning of 1941 seemed to have diminished the rivalry between the Secours National - a private French charity organization created by Dr. Lambling in Vichy - and Huard's Health Secretariat. It was, thus, no accident that the creation of the Health Ministry in the summer of 1941 was followed six months later by the creation of the INH. Still, it is necessary to examine the respective roles of the Vichy government and American aid. A memorandum drafted by Chevallier, presumably for Huard, offers some insight on this. The Ministry of Family and Health can only accomplish the work required of it as a great technical ministry by establishing a parallel agency which guarantees its scientific value. In the current state of affairs, these guarantees can only be provided by universities and large scientific enterprises such as the Pasteur [Institute]. Avoiding this collaboration would automatically reduce the Institut d'Hygiène to an institute whose professional staff's activity would always be in an unequal competition with that of the universitie. This first point could be developed at length, as it was with Dr. Strode [the Rockefeller officer who directed the Marseille institute with Chevallier] who ended up agreeing with its accuracy. The INH will therefore have as its goal the coordination of all the research activity in the field of health. ("Schéma d'organisation d'un institut national d'hygiène au secrétariat d'Etat à la Famille et à la Santé," note without date but probably fall 1941. Arch. AC). Article 1 states : a public establishment is created in Paris with the name Institut National d'Hygiène. This establishment is under the Ministry of State for the Family and Health." More than an institute in the traditional use of the term, the INH was thus a new government agency built along the model (and in collaboration with) the CNRS. It was located on the grounds of the pharmacy division of the Ministry of Health on the Rue Cardinet in Paris. Article 2 of the law indicated the goals of the new institute. 1. to conduct laboratory work of interest to the public health, such as conditions of utilization and means of applying scientific research to achieve a safe water supply, problems of nutrition, etc. 2. to coordinate health investigations by different organizations and institutions in order to insure their availability. These two points illustrate the double mission of the INH. The first gave it responsibility for all research done in France in the field of public health, i.e., at the existing public health institutes or in the laboratories of the medical faculties, etc. Among the former was the Institut des recherches d'hygiène at Marseille which with support from the Rockefeller Foundation did studies aimed at improving the food supply. For example the rationing card "J3" for adolescents was established in conjunction with studies by nutritionists at the Marseille institute and the CNRS. Likewise, at Paris the INH took over financing of nutritional research by Hugues Gounelle which was partly supported by the Fondation Foch. This replacement of private funding by public funding elicited a protest from a member of the board of the INH representing the Ministry of Finance who did not think it was appropriate for the government to support a private foundation. The rest of the board members (all scientists) did not agree, and Gounelle received the INH funding. In the INH budget for 1943, which totalled 15 million francs, 5 million went to the support of existing laboratories and institutes (including 1.5 million for the Marseille institute), and 5 million went to fellowships for medical researchers at medical schools. In 1944 the INH budget increased to 20 million francs. The second purpose of the INH was to modernize the infrastructure for health research in a country where until then it was lacking. (Aublant to the INH Board, 15 July 1942, CAC AN 76215, box 1, archives of INH) Overall, this meant creating the means to collect data necessary to develop health policy. It is significant that in conducting nutritional studies and creating modern techniques for epidemiological research, the INH utilized the experience of Anglo-Saxon researchers and the work done by the League of Nations between the wars, rather than earlier German models from the beginning of the twentieth century. See, for example, references by Chevallier to the work of M. Bigwood for the Health Organization of the League of Nations in the 1930s. The INH placed the most emphasis on questions of prenatal care and pediatrics in response to the problems of food shortages. The mission of the INH, thus, clearly supported the natalist and family policies pronounced by Vichy. Early in 1942 André Chevallier underscored the large task facing the INH, when he wrote, "France is the country with the greatest demographic deficit in the world." (Conseil d'Administration, INH, April 1942) Raymond Grasset, the successor to Huard as Minister of Health, signed into law the requirement of a premarital medical examination (Law of December 1, 1942), which was inspired in part by the positive approach to eugenics in France as well as the desire to extend further the close monitoring of the health of children under 6 years of age by means of a "carnet de santé." (Raymond Grasset, " L'organisation sanitaire de la France," La Santé des Français, réalisations et projets du Secrétariat d'Etat à la Santé, les Documents Français, 4 année, 12, déc 1942). The INH was divided into four sections. The first addressed problems of Nutrition especially in relation to pediatrics. In 1942 it launched studies in the maternity hospitals of Clermont Ferrand (9,000 questionnaires), and then Lyon and Marseille in order to follow the nutrition and growth of newborns. It also conducted research on work and motherhood in Paris, Marseille, Lyon, and Montpellier with the help of the American Red Cross. Another section of the INH worked on social diseases. In the department devoted to tuberculosis, Professor Troisier extended an earlier study begun in 1936 in the hospitals of Paris and sanitoria. Its goals were to resolve the controversy about the transmission of tuberculosis between mother and child, and to compare the results of climatic treatment with those obtained from BCG vacination. It was a very large study based on 18,000 questionnaires from 150 sanitoria. Another department in the social disease section worked on cancer and was directed by Dr. Denoix who later worked for INSERM. The department established a central depository of records for 35,000 patients, half of whom came from the hospitals of the Assistance Publique in Paris, and they provided the basis of the first etiological study of cancer in France. In addition to the epidemiological studies of cancer, the INH also financed therapeutic clinical research which later became an important part of the INSERM work. For example, in 1943 a pilot study was supported on the biology of metastasis at the Cancer Center of Lille; there was a project on the optimal wavelength to be used in radiobiology at Montpellier; and the INH also aided the first research on chemotherapy by Lamarque at Orléans and Limouzy at Lyon. The Alcoholism Department, directed by Dr. Desrobert, periodically examined the statistics from psychiatric hospitals and showed the decline in the incidence of cirrhosis in the French population as a result of the shortage of alcohol caused by German requisitions. Likewise, the Department of Venereal Disease monitored the effects of the Law of December 31, 1942 on the mandatory reporting of syphilis. The General Hygiene section conducted a study in conjunction with the 'Génie rural' on drinking water on the Loire valley as part of a campaign against typhoid fever; and the Industrial Hygiene Section studied workplace illnesses, such as lead poisoning among the workers at the Imprimerie Nationale. The section which had the most difficulty in doing its work was epidemiology, primarily because of the tradition of corporatism and the silent resistance of French practitioners to social medicine. For example, despite a recommendation from the INH, the Vichy government decided not to establish the mandatory reporting of tuberculosis for fear of protests about breach of medical confidentiality. Even with this unexpected setback, the Director of the Epidemiology Section, a young clinician Dr. Alice Lotte, was remarkably successful in collecting data, especially considering the difficulties imposed by the war. 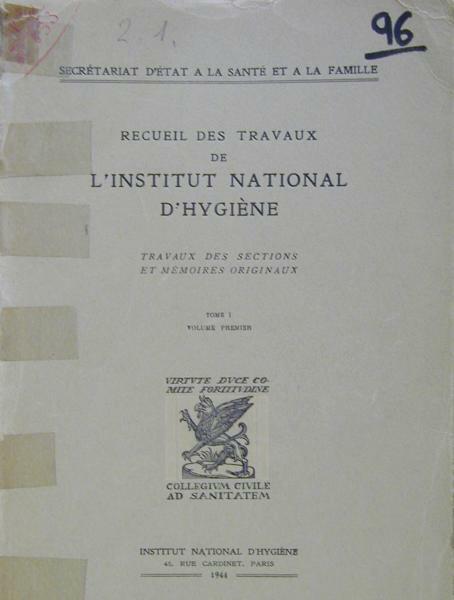 The epidemiology statistics of the INH were published in the 'Recueuil des travaux de l'Institut National d'Hygiène' whose first issue appeared in May 1944. It also contained a map of the epidemiology of typhus, diphtheria (the vaccination for which was made mandatory by the Law of November 24, 1940) measles, and scarlet fever which showed an alarming rise in the departments of the west because of bombings. The INH statistics also revealed the spread of an epidemic of polio in the Auvergne in 1944, as well as a few cases of the plague in Corsica. The 'Recueuil des travaux of the INH' also published several original studies by different public health laboratories it supported. For example, an article by Daniel Kuhlmann at Marseille on the nutrition of the local population in 1942 corroborated the findings of nutritional deficiency pathology by Violle and Nabonne who studied infantile mortality from gastroenteritis and problems in the milk supply. By the time of the Liberation of France, there had been a considerable amount of work by the INH. Nonetheless, André Chevallier did not escape some criticisms of his efforts. In August 1944, as a result of a charge by a former employee, Chevallier was brought before the Comité díépuration for the Health Ministry. An INH employee, Jacques Bureau, a member of the Resistance arrested by the Germans in 1943, accused Chevallier of not intervening on his behalf to obtain his release. Chevallier had little difficulty in explaining his lack of action, because of the risk that it would have prompted the authorities to conduct a wider search of the INH offices and laboratories where a number of people were working in hiding with false papers among which two Jew physicians and he quickly resumed his position as head of INH, but his problems were not over. Chevallier soon faced another charge which reveals some of the paradoxes of this period. The new Minister of Health, the communist François Billoux, accused Chevallier of collaboration; not with the Germans but with the Americans ! In fact, after the liberation Chevallier reestablished contact with his American colleagues, notably his friends in the Rockefeller Foundation. An internal Rockefeller memorandum from a representative in France (Letort) back to the New York headquarters shows that the foundation closely followed the fortunes of the INH : "As you already know, the new administration began by revoking him and then reinstated him practically at once. His personal position now seems to be secure, but he is somewhat concerned about the Institute. There appears to be a great deal of pressure from the Ministry of Finance to deprive it of its autonomy and have it placed under the direct control of the santé publique. Such a measure would be disastrous, as it would deprive Chevallier of the power of nominating his personnel which would then be designated directly by the Ministry of Public Health, and this might lead to the introduction in the institute of persons politically in favour rather than pure technicians. Chevallier frankly stated that he would not stand such a change in status and would resign at once if it were put through". (R. Letort to D. O'Brien, 17 October 1944, Rockefeller Archives Center, IHD in Europ files). In fact, for reasons which were evidentally political - i.e. upcoming elections -, the Communists wanted to emphasize the deprivations of the working class under Nazi occupation. Thus, at the end of October 1944, Billoux gave an interview to the American Associated Press, where he claimed, "four years of German occupation left 75% of the French people underweight and threatened by disease." (J. M. Gibson (Alabama, Dept. of Public Health) to Billoux, 31 October 1944, archives AC). To what extent were the French starving during the German occupation? "It is certain that when there is a rise in the death rate in a country like France in 1940, it is the old, the poor, those without social support, those with certain chronic illnesses who begin to die.../But in another sense, the restrictions of the war have raised the awareness of the poorly balanced diet of the French which was well-known before the war (too much fat, not enough vitamins)". (A. Chevallier, J. Trémolières, Ibid.). This was a lesson that nutritionists could draw upon to propose a food supply in the future that was better balanced for the French, but not necessarily one that confirms the image of a working class exploited and deprived by the Nazi occupiers. Given the latent conflict with his superiors in the Health Ministry and under pressure from certain members of the Resistance, Chevallier decided to leave the INH at the end of 1945. The Minister of Education, René Capitant, named him to the Chair of F. Vlès (who died after being deported) at the Medical School of Strasbourg. 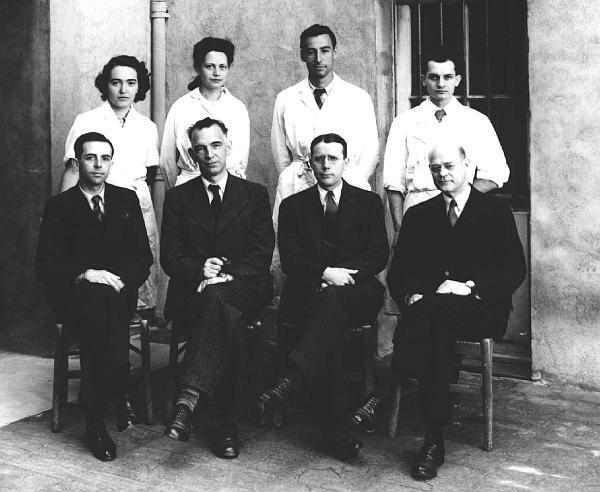 Shortly thereafter Chevallier returned to the study of Curie radiation therapy and created the Paul Strauss Cancer Center, which was one of the first in France to carry out an active program of medical care using ion-rays (cobalt therapy). This was also the specialty of Chevallier's successor at the INH Louis Bugnard, a Professor from the Medical Faculty at Toulouse. Bugnard returned from six-months of study in the United States to become INH director in August 1946. Under his auspices a Scientific Board was created for the INH, which included Chevallier as well as Robert Debré; and Bugnard also established a system of fellowships for doctors who wanted to travel to the U.S. for training. Shortly thereafter the INH created its own laboratories, the first research unit established (U.1 INSERM, Unité de recherches de nutrition et de diététique humaine) being that of Jean Trémolières, the nutritionist whom Chevallier had recruited for the INH in 1943. Gradually the INH evolved from its emphasis on public health into new areas of research in biomedicine, and the INH formally changed its name to that of INSERM in 1964.